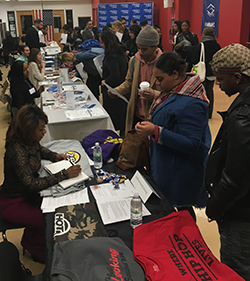 Photo Caption: Berkeley College students and alumni pursuing careers in marketing met with potential employers during a career fair held at the College’s campus at 12 East 41st Street in Midtown Manhattan, on February 1, 2017. Participants included Aerotek, Americo Group, CBS Network, Emmis Communications, Forum Group, Freedom Care, People’s United Bank and Tommy Bahama. Berkeley College offers AAS and BBA degrees in Marketing Communications. The program is geared toward students interested in generating creative solutions to marketing problems through integrated communications, and offers courses that cover market and consumer research; strategic positioning; creative development and execution; media planning and execution across current traditional, digital, mobile, and social marketing vehicles. Read more about the Berkeley College Marketing Communications program by clicking here. Also click here to read how alumnus Paul Sucec applied the lessons he learned from Berkeley College’s marketing courses to his growing career at ESPN.